I came up with this dish one evening when I had some veggies and goat cheese in the fridge that needed to be used up, but I wasn't in the mood for pasta, soup, or a fritatta (my usual go-to dishes for using up random veggies). Polenta, however, sounded just right for a chilly, rainy evening. I really like this dish because it is very quick and easy to pull together, and it's infinitely adaptable to what you have on hand. The veggies could be switched out with almost anything, the goat cheese could be replaced with cheddar or Parmesan, and the egg could be swapped out for another protein like leftover shredded chicken or bacon (mmmmm, bacon). One thing that I think really added to this dish was the bits of Meyer lemon that I roasted along with the veggies. I got the idea from Aarti Party, where Aarti suggested roasting lemons in a different roasted veggie dish. It's totally genius - the tartness of raw lemon mellows and leaves behind fantastic lemon flavor. The Meyer lemons I used can simply be eaten peel and all (provided you cut the pieces small enough), although I'm not sure if this would work with regular lemons, which have a thicker peel. If not, you can always scrape the lemon flesh out with your teeth and leave the rind behind - after all, that's the beauty of eating dinner by yourself - you don't have to be polite! Speaking of, although this recipe is written for one, it could very easily be multiplied to serve as many people as you can quickly prepare eggs for (or, if you're making scrambled eggs, pretty much any number of people). Just eyeball it with the veggies and plan on about 1/4 cup uncooked polenta per person. You may also need a smaller proportion of water to polenta when preparing a larger batch. 1. Preheat the oven to 450 degrees. Toss the veggies and lemon with the olive oil and a generous sprinkle of the salt blend (or salt and pepper). Place on a foil- lined baking sheet. Roast in the oven, stirring occasionally, until caramelized and tender. 2. Meanwhile, place the polenta and water in a small, non-stick pot and bring to a boil over medium-high heat, stirring constantly. Lower the heat to a simmer, and cook, stirring frequently, until tender. Add more water as needed. Stir in 1 T goat cheese until melted. Season to taste with salt and pepper. 3. When the veggies and polenta are a minute or so from being finished, cook the egg however you like it (I made mine over easy, but sunny side up, poached, or scrambled would also work well). 4. Scrape the polenta into a bowl. Top with the egg, and dot with additional goat cheese. 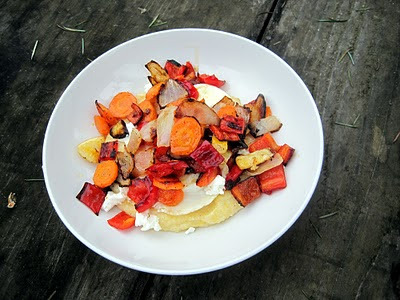 Scoop the vegetables off of the baking sheet and onto the polenta and egg. Serve hot. This recipe is perfect! I love anything with goat cheese, but my boyfriend does not, so a recipe for one is just what I need. Thanks! Looks delicious! I especially like the fried egg addition!